teve Hyde was born in Iowa, USA in 1971. Noit was born in Cambodia. When Steve was six years old his family moved to the Philippines as missionaries where he grew up and learned about missions. In 1993 Steve went as an exchange student to Tashkent, Uzbekistan as part of his bachelor degree and there he felt the call of God into missions as a life calling. A few months later he moved to Cambodia where he has permanently resided since then. Steve’s parents spent more than 30 years in the Philippines as missionaries. On March 4, 2003 Muslim terrorists killed Steve’s father (Bill Hyde) in a bomb attack in Davao city, Philippines. Steve went to Cambodia in 1994 after college in Texas. Steve (Oct 26) and Noit (Aug 15) were married in 1999 and have four children Paul (Dec 15), Anna (June 10), Odom (June 9), and Pearl (June 16). (Birthdays noted) Words of Life Ministries was started in 1997 in order to develop training materials for church leaders in Cambodia. Over the years, not only is Words of Life the largest publisher of Christian literature in Cambodia, but they also operate a nation-wide training program with currently has hundreds of church leaders being trained each year in Cambodia. This large training ministry gave birth to the Antioch Institute. In 2003, in an effort to disciple children who had no access to education, they started the Imparting Smiles Association which has two children’s centers, a university dormitory and a woman’s center in different provinces of Cambodia. Their ministry stretches to every province of Cambodia. On February 9, 2010 Steve Hyde was awarded the medal of the Royal Order of Sahametrei for distinguished services to the King and the people of Cambodia. He was given the rank of “Officer” or “Sena” in Cambodian. 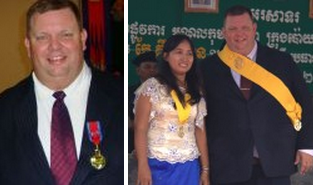 Both Steve and Noit were honored with medals from the Cambodian government in June 2010 at the dedication of the Imparting Smiles Children Center in Poipet.